Almost everyone residing in a developed nation knows someone who has engaged in paid work that is licit but not reported to the government (e.g., babysitting, gardening, construction, financial consulting). But while most acknowledge that such work is helpful to the individuals involved, and that informal work may enhance a sense of community, most scholars view it as a pre-modern form of exchange and something that disappears as capitalist markets expand globally. Both mainstream and heterodox economics typically assume that there is an inevitable shift towards the formalization of goods and services provisioning as societies become more "advanced" or "developed" (the "formalization thesis"). In these views, the existence of informal activities is a manifestation of backwardness and it is assumed that they will disappear as an economy becomes more "modern." 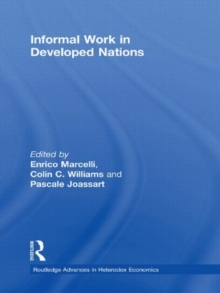 This book challenges these conventional theses about the linear trajectory of informal work and economic development by arguing that informal work is not trivial for understanding modern capitalist economies, and that both mainstream and heterodox theories about the economy must be altered to address the role of informal work in relatively developed economies. This edited collection focuses on informal work in various developed nations, including Canada, the United States, and several in Europe. It will therefore be of interest to policymakers, as well as students and researchers in development studies, social policy, sociology, anthropology, public health, geography, economics and planning. Enrico Marcelli is Assistant Professor of Sociology at San Diego State University, USA. Colin C. Williams is Professor of Public Policy at the University of Sheffield, UK. Pascale Joassart is Assistant Professor of Geography at San Diego State University, USA.